Cities Connection Project | WOHNSIEDLUNG WERDWIES. ZURICH-ALTSTETTEN. The course of the river Limmat and the motorway represent two of the outer limits forming the boundaries of the island-like Grünau quarter in Zurich, Switzerland. The Werdwies residential complex provides the quarter with an open centre characterised by the density of an inner space. The complex consists of seven rhythmically positioned rectangular constructions along the Grünauring and the Bändlistrasse, creating a sequence of built and open spaces. In between, smaller and larger squares open up the complex to the quarter. 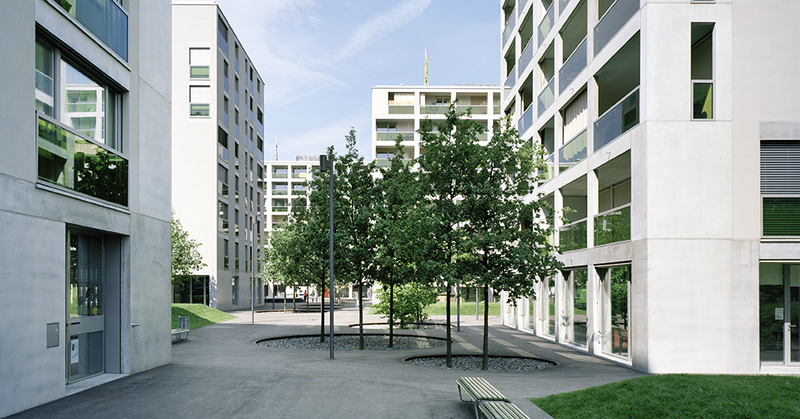 This open structure interweaves with extensive green areas in the north as well as with the parcelled southern part, establishing a comprehensive spatial connection within the Grünau quarter. The seven buildings are surrounded by a hard covering which allows pedestrians and cyclist to move freely within the complex. Dispersed desk-high sections of lawn and a large fountain channel the flow of movement and delimit quiet retreat areas. About 100 trees underline the park-like character of the complex. All of the trees were planted with gravel-filled grates so as to allow the rainwater to seep into the soil. In accordance with the public character of the outdoor spaces, the ground floors house a food shop, a bistro, several smaller commercial premises, two kindergartens as well as a crèche. These public uses constitute a significant contribution to the infrastructure in this Quarter on the outskirts of the city. All of the 152 apartments are located on the upper floors. Mirroring the spatial interweaving with the adjoining parts of the Quarter, their long loggias create a dense relationship between interior and exterior space. 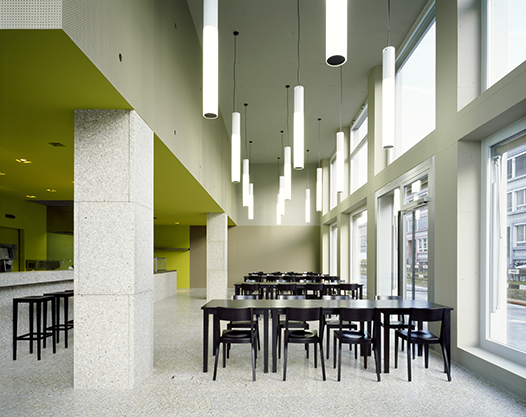 Each apartment includes a sequence of rooms lighted from different directions, with areas for living, eating and sleeping, connecting to the continuous loggias crosswise or lengthwise. Simple layouts with long rooms, built-in cupboards extending over the whole length of the wall as well as the generous loggias give the apartments a robust character which appeals to a broad public. The landscape and the residential living world are combined in this concept of transition to create a special atmosphere for local daily life.